Pinwheel cookies are so beautiful and can be made with a variety of colors. I’ve seen red and green for Christmas, yellow and pink for spring, and black and orange for Halloween. I chose this pretty teal color for these pinwheel cookies. I participated in a cookie swap where you bake a batch of cookies and mail them to someone and you get a box of cookies in return. What a thrill it’s been to bake and package beautiful cookies, while anticipating the arrival of cookies from another food blogger. I wanted the cookies I sent to have a WOW factor, which is where this recipe came in perfectly! Here they are all boxed up. I picked out these cute little boxes before I even decided I was going to make pinwheel sugar cookies. I got the tins at the dollar store. Yep, these cute metal boxes were a buck a piece. Deal! I snapped up three of the boxes and brought them home as I contemplated what would go inside. 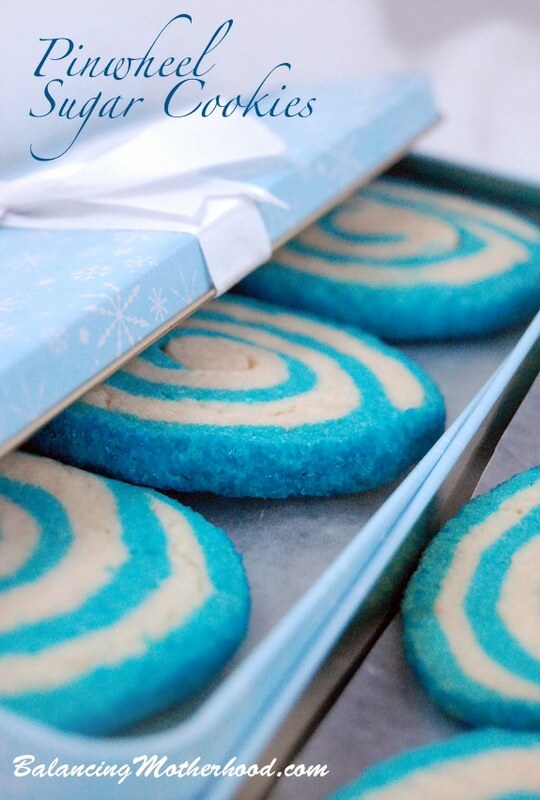 I decided to do a pinwheel sugar cookie in blue to coordinate with the boxes. I didn’t want to get too Christmas-y, not knowing what holidays my fellow bloggers celebrated. As it turns out, the cookies fit PERFECTLY in the box. Twelve cookies fit perfectly into the box. I used a standard sugar cookie recipe. One batch I kept plain, the second batch I colored blue. For three dozen cookies I needed a lot of dough. Then I rolled out each layer. You want them to be about 11 inches wide. Put one layer on the other and trim the big pieces to a nice rectangle. (I know this photo isn’t great, I must have had too much sugar at this point.) Gently roll it with your rolling pin to secure the dough to each other. You don’t want to push too hard, just enough to get the layers to stick together. You can tab on a little water to act as a glue, but be careful to not use too much. Now it’s time to roll this baby up. This is harder than it looks because the layers may not be totally secure, and you tend to get a lumpy log in parts. Don’t worry, just roll it up, tucking as you go. Once you have a nice log like the one in the photo. you can use your hands to squish it a bit to even it out. I also held my hand flat and butted it up against the ends to make it even. Now the fun part. Lay sprinkles on the counter and roll the log on them, covering every inch of the log. I used almost an entire jar of sprinkles for each log. Once it’s rolled in the sprinkles, you wrap it in plastic wrap and refrigerate for at least an hour. Maybe two. You want the log to be solid so that you can cut uniform circles. This log has been chilling and looks beau-ti-ful. I cut cookies with a sharp knife (I used a serrated knife) about 1/4 thick. Once on the cookie sheet, I rounded them out a bit (they can tend to get squished with the cutting) with my hands. Try making these colored sugar cookies! They make a great gift for teachers or neighbors. And, they’d be the hit of a cookie exchange! Make sugar cookie dough per your instructions. Cut cookie dough in half. Add a few drops of food coloring in the other half and mix. Roll out each half of the dough, about 1/4 inch thick. Alicia, your cookies look so fun! I love the sparkle 🙂 I’m glad you enjoyed the pecan tassies. Happy holidays! i love the color! they look yummy! Thanks, I think the blue made it a bit different. I love this idea. The pinwheel cookies look amazing. And I think I will get the recipe for the pistachio ones. Yum! Alicia! These sugar cookies were absolutely delicious!! I thought the blue and sprinkles were absolutely festive!! I love pinwheel cookies! And the blue is a fun touch. My kids enjoy making these every year! Oh wow these look great and you’re so talented! These will make any event more special! Wow, those are so pretty! I love the bright color! The color is really pretty! And they look really good! Loving how cute the swirls look! The blue is a nice little diversion from the typical red and green.. so yummy! These are beautiful! It could also be fun to do red and white! wow these look so colorful and yummy! They look so yummy! I love the boxes, so cute! I love these cookies. They seem so fun and festive! I love that you can make them ahead of time too! Adding this to our Christmas baking plan! This is a fun idea for the holidays! How pretty are these cookies!? Perfect for a Frozen themed kids party too! Thanks for sharing this great cookie recipe! These are so pretty! I love that they work for Christmas or any party with a theme color. These cookies look absolutely scrumptious. And I love the pretty tin boxes, too.